Today, Jesus shows Himself to the world as God and the Lord of the world. The Magi saw a star and set out immediately. Their faith was strong and sure. They had generous hearts. Their souls were ready to make the long, arduous journey. They didn’t give up although the star disappeared at one point. My meditation today reminds me that when God urges us to greater generosity and closer union with Him, we need to be like the Magi and follow His urging with faith, promptness, selfless generosity, and perseverance. He is our Quest and we must not give up, even if the star of faith in our soul disappears and we feel an interior darkness. These periods of darkness are part of His will and so we must overcome them with a pure, naked faith. In other words, no matter what, we trust in Him. Sometimes I pray, “Lord, what do you want from me?” The Feast of the Epiphany reveals some of the answers. He wants my co-operation. He wants me to pray and work for the conversion of those who are near to me (family and friends) and those are far away (strangers.) He wants the incense of prayer, the myrrh of suffering for the love of Him, and the gold of charity. O Lord, please let Your star shine for me today so I will only take the road that leads directly to you. I get the Morning Offering from the Catholic Company. (http://tinyurl.com/mtp7nd5 if you want to subscribe.) 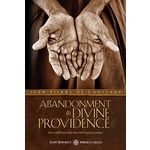 Today’s meditation from Abandonment to Divine Providence was just what I needed. I added the bold. I forget sometimes that my particular path to holiness will consist of a lot of small things done with love and prayer. And, I must not forget forgiveness. If the cross teaches nothing else, it must teach us forgiveness. 41. The transmission of faith occurs first and foremost in baptism. Baptism is something we receive. It is both a teaching to be professed and a specific way of life that “sets us on the path to goodness.”Baptism helps us to understand that faith must be received by entering into the Church (ecclesial communion) which transmits the gift of faith from God. 42. From the outset our journey of faith beginning in Baptism is revealed. First Baptism is bestowed by invoking the Trinity. Our new identity as a brother/sister to Christ is clearly seen by our immersion in water. Water is at once a symbol of death, inviting us to pass through self-conversion to a new and greater identity, and ka symbol of life, of a womb in which we are reborn by following Christ in His new life. Baptism should change us profoundly. It changes our relationships, our place in the universe, and opens us to living in Communion with the Trinity. The waters of baptism flow with the power of Jesus’ love. He is faithful and trustworthy, so we can trust our faith. 43. This passage speaks of the importance and meaning of infant baptism. This is a beautifully written passage well worth reading in Papa Francis’ own words. Parents are called, as Saint Augustine once said, not only to bring children into the world but also to bring them to God, so that through Baptism they can be reborn as children of God and receive the gift of faith. 44. As important as Baptism is, the sacramental nature of faith finds its highest expression in the Eucharist. In the Eucharist we find the intersection of faith’s two dimensions. On the one hand, there is the dimension of history: the Eucharist is an act of remembrance, a making present of the mystery in which the past, as an event of death and resurrection, demonstrates its ability to open up a future, to foreshadow ultimate fulfillment. . .On the other hand, we also find the dimension which leads from the visible world to the invisible. Body and Blood, Soul and Divinity. Christ becomes present to us and moves us body and soul to our fulfillment in His Father. 45. In the celebration of the sacraments the Church hands down her memory especially through the profession of faith. We are speaking about the Creed here. The Creed has a Trinitarian structure. When we recite the Creed we are stating the the core and inmost secret of all reality is the divine communion of the three Persons in One God. We are taken through all the mysteries of Jesus’ life and finally, we are taken up, as it were, into the Truth that we are professing. Reciting the Creed truthfully and thoughtfully should change us, too. All the truths in which we believe point to the mystery of the new life of faith as a journey of communion with the living God. Two other essential elements in the faithful transmission of the faith are the Lord’s prayer and the 10 commandments. The Decalogue is not a set of negative commands, but concrete directions for emerging from the desert of the selfish and self-enclosed ego in order to enter into dialogue with God, to be embraced by His mercy and then to bring that mercy to others. So the four elements around which the Church’s catechesis is structured are the Creed, the Sacraments, the Decalogue, and prayer (especially how Jesus taught us to pray.) This is our storehouse of memory of faith that the Church is empowered by apostolic succession to pass down through history. Faith is One! First, it is one because of the oneness of the God Who is known and confessed. Second, Faith is one because it is directed to the one Lord; to the life of Christ. Finally, it is one because it is shared by the whole Church which is one body and one Spirit. 49. The Lord gave His Church the gift of apostolic succession. It is through this that the continuity of the faith is ensured. The Church depends upon the faithfulness of the Magisterium chosen by the Lord. Thanks to the Magisterium of the Church, this “counsel” is preserved in all its integrity and joy for us. Praise the Lord! So ends Chapter Three of Lumen Fidei. We will take up Chapter Four, next week. Hope you all are staying with me through this study as we approach the end of this glorious Year of Faith.